Apple iPad Mini 2nd generation touch screen / digitiser black, this is the part you require if you have damaged the front glass on your iPad Mini 2nd generation and it has cracked, or if the touchscreen is not responding to any input. Please note this touch screen replacement part requires soldering the interconnecting board from the old iPad mini touch 2nd generation screen to the new replacement iPad mini touch screen cable. 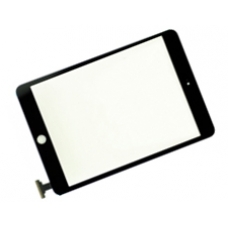 * Black iPad Mini Digitizer Part.